Enrollment management teams at colleges and universities in the United States are in the midst of a shared challenge. Based on projections reported by the Western Interstate Commission for Higher Education, the total number of high school graduates will remain stagnant until the year 2023, ending a 15-year streak of consistent growth in graduating high school class sizes. In the face of a more competitive and increasingly diverse recruitment pool, it’s important for higher education institutions to leverage recruitment data and analytics to identify new populations of prospects to nurture – an excellent use case for CRM tools like Salesforce. While existing student information systems (SIS) may store plenty of data on applicants, some legacy systems often aren’t configured or even equipped to handle data on student inquiries or recruitment events and correlate it all with admission outcomes. 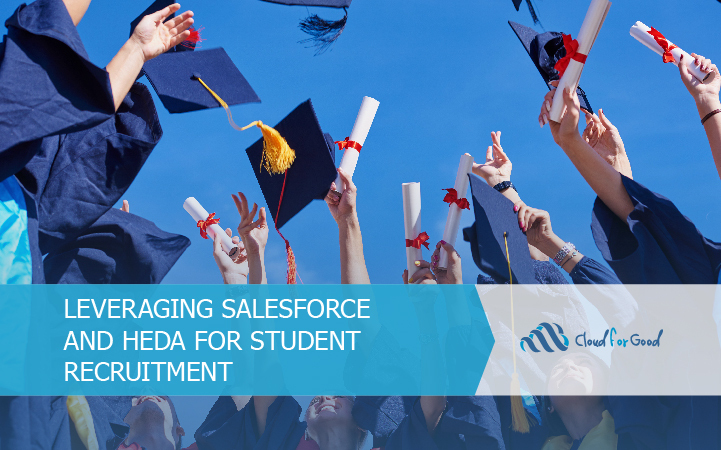 Many schools have already turned to Salesforce’s Higher Education Data Architecture (HEDA) to efficiently track the many types of one-to-one interactions between prospective students and universities. It provides a flexible platform to integrate with an SIS, out-of-the box configuration and reporting tools to help enrollment managers become more strategic in their recruitment efforts. One important metric in strategic enrollment management is the concept of yield. It’s a percentage that measures a school’s selectivity and success of recruitment efforts, obtained by dividing the number of students who choose to enroll at a school in a given year (i.e. those who submit a deposit), by the total number of acceptances offered. Since budgets for recruitment and admission events are always tight, knowing where to find the biggest return on investment for yield is crucial when planning annual travel to high schools and college fairs. HEDA’s out-of-the-box Affiliations functionality can record all of a prospective student’s connections to schools and organizations. This can help your institution quickly identify which schools are producing highly interested and qualified applicants when integrated with your SIS. With Salesforce’s standard Campaign object you can also keep track of who’s attending college fairs, campus tours or admission events. These touch points are linked back to the individual student, making it easy to identify which events helped contribute to yield. All of this provides universities with the information needed to see returns on investment and strategically allocate their recruitment dollars moving forward. Summer melt is a noted trend of prospective students’ interest in attending college “melting” away during the summer between the end of high school and beginning of college, especially among low-income or minority communities where resources or guidance are sometimes limited. Tackling the summer melt challenge can often require early and personalized interventions, without which an institution can find itself at risk of missing enrollment targets and failing to make a full class. Salesforce’s productivity and case management tools can empower enrollment service teams to provide timely and personalized support to prospective students – all in one system. Cases can be automatically routed to the appropriate staff or teams for review, and native phone call and email logging features make it easy for users to keep track of ongoing conversations with prospects to get a full picture of their needs. Take it one step further with Salesforce Communities, where you can create a self-service portal for students to view their open cases or access an existing knowledge base. With the power of HEDA’s one-to-one model, all of your summer melt efforts are related back to the individual student for easy reporting. Salesforce and HEDA keep your Contacts at the heart of it all! With a smaller and diverse recruitment pool, schools also need to be strategic in their marketing efforts to better build a “creeping commitment” from prospects. Nurturing the right student’s growing interest in your school is hard if your data structure is a big hurdle, but HEDA is designed with students at the heart of it all. Prospective students are stored as a Contact and related to standard Salesforce objects like Cases and Campaigns, as well as HEDA’s custom objects like Program Enrollments and Affiliations. This makes it easy to identify the right populations of prospective students and send them the right communication at the right time. You can even integrate with tools like Marketing Cloud and Pardot to automate the process and relate communication efforts to prospective student outcomes, whether it’s for yield, melt, or increasing your application numbers. 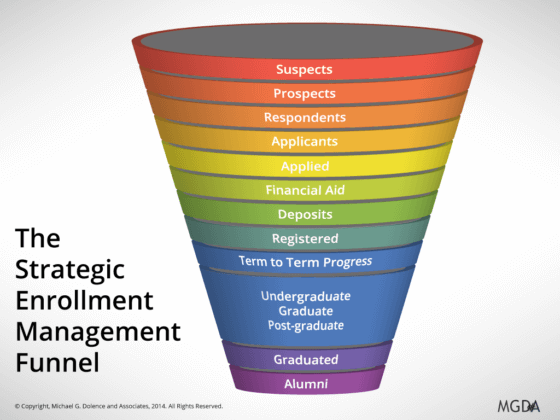 Recruitment is just the top of the strategic enrollment funnel, and HEDA is an architecture built with the full student lifecycle in mind. When you’re ready to integrate current students, alumni and development efforts, HEDA is one step ahead. It comes pre-packaged with custom objects for Course Offerings, Course Enrollments, Program Enrollments and Terms, and can be customized to support advancement fundraising efforts as well.